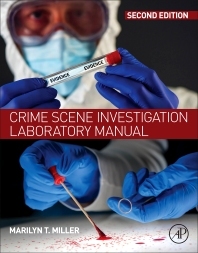 Crime Scene Investigation Laboratory Manual, Second Edition, is written by a former crime scene investigator and forensic scientist who provides practical, straightforward, and immediately applicable best practices. Readers will learn the latest techniques and procedures, including deconstructing first responder contamination, the preliminary walk-through, utilizing associative evidence, enhancing trace, biological and chemical evidence, and reconstructing scenes through wound dynamics, glass fracture patterns, bloodstain patterns, ballistics, and more. This lab manual provides information and examples for all aspects of crime scene investigation. In addition, included exercises teach the proper techniques for securing, documenting and searing a crime scene, how to visualize or enhance the evidence found, how to package and preserve the evidence, and how to reconstruct what happened at the crime scene. This manual is intended to accompany any crime scene investigation textbook. Marilyn Miller is a graduate of Florida Southern College with a bachelor’s degree in chemistry. She earned a master’s degree in forensic chemistry from the University of Pittsburgh and a Doctorate in Education from Johnson & Wales University in post-secondary educational leadership. Miller is a tenured, associate professor in the Department of Forensic Science at Virginia Commonwealth University. As a post-secondary educator for almost twenty years, she teaches a wide variety of forensic science and crime scene investigation classes to both forensic science and criminal justice majors at the undergraduate and graduate levels. She is a Fellow in the Criminalistics section of the American Academy of Forensic Science, the Southern Association of Forensic Scientists and the American Chemical Society. Miller is a former faculty member at the University of New Haven and the Henry Lee Institute of Forensic Science/ National Crime Scene Training Center. She has presented and taught as part of hundreds of forensic seminars across the United States and foreign countries. She is the author or co-author for several textbooks or chapters concerning crime scene investigation or reconstruction and forensic science. Before coming to VCU, she worked as a supervisor and forensic scientist for law enforcement agencies in North Carolina, Pennsylvania and Florida. She has testified over 400 times in county, state and federal courts of law as an expert witness in the field of forensic sciences and crime scene reconstruction. She has participated in hundreds of crime scene investigations, both as an active investigator. Currently, she also serves as a consultant for both prosecutors and defense attorneys. Miller designed, opened and operated crime scene units and forensic laboratories on the West Coast of Florida for over ten years.